An exhibition of carnival costumes from the (Leeds) Chapeltown West Indian Carnival opened on Saturday 13th October 2018 in church. 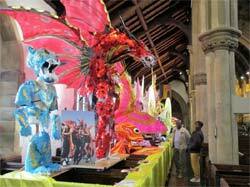 These were designed and made by Hughbon Condor and family of High Esteem Carnival Designs. Over the years, Hughbon and his son Sephbon have won many awards at carnival queen and king shows. This year (2018), the dramatic and stunning “King Beast” costume (pictured above) won the carnival king competition. During the afternoon Cedric, a member of St Martin’s congregation, played the steel pans which gave an authentic Caribbean sound to the proceedings. Councillor Sharon Hamilton formally opened the event. Following this Hughbon and Sephbon gave a fascinating presentation about how their costumes have evolved over 50 years of the Leeds carnival. They provided an insight into how they design and build such huge pieces of work. Hughbon aims to improve on his work year on year. 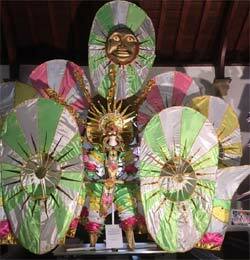 Sephbon ensures that his costume allows for enough movement to enjoy dancing during the carnival procession. 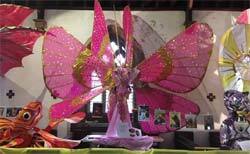 The beautiful and colourful “Pink Butterfly” costume won both the Leeds and the Huddersfield Carnival Queen competitions in 2003. The costume titled “Salute” was created as part of the Queen’s Diamond Jubilee celebration and featured the Queen’s coat of arms and Union Jack flags. 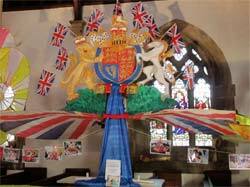 It won the Huddersfield Carnival Queen competition in 2012. Refreshments were provided during the opening afternoon including a variety of Caribbean foods. Thank you to all who worked hard to bring such an event to St Martin’s Church.